Are you concerned about the protection of your personal data when you are on the web? 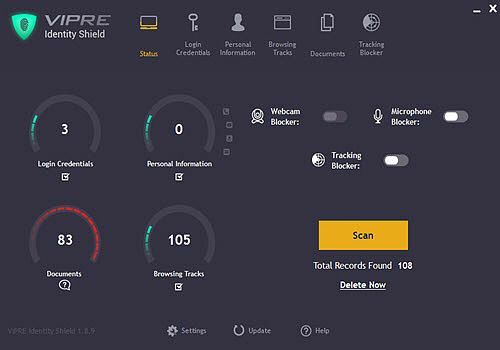 The security software publisher Vipre also offers the Vipre Identity Shield program. The purpose of this software is to protect users' data and preserve their privacy. For example, Vipre Identity Shield can manage access to your microphone and webcam to prevent malicious sites from accessing them. The program also has a safe to store your most valuable documents. When you are on the Internet, Vipre Identity Shield remains vigilant and warns you of the potential risks of losing data. This is a paid software but a trial version is available to test the software's features before purchasing it. Avira Privacy Pal is a free software that allows you to manage your computer's privacy settings and erase your tracks when you are on the Internet. ActiVPN is a VPN software made in France that allows you to browse the Internet anonymously, and without georestriction. Contrary to what its name may suggest, Comodo Internet Security Essentials is not an antivirus. This is a program that ensures that you are safe when you check your accounts online or when you are on merchant sites. WithoutTrace is a software that aims to protect your privacy from prying eyes. Believe it or not, just about all your actions are recorded somewhere. UltraSurf is a free software that allows users in countries that censor the Internet to visit all the world's websites safely and freely.